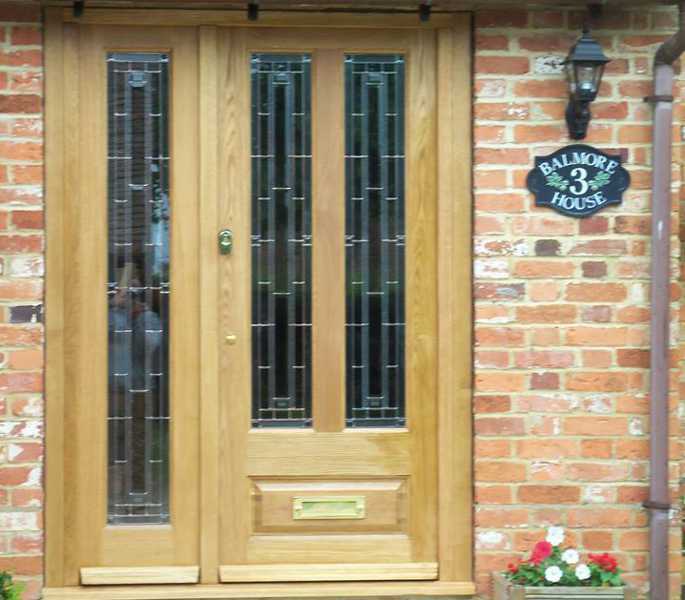 Stopping the UV damage caused the sun while keeping the grains and colour of the timber visible is extremely difficult. 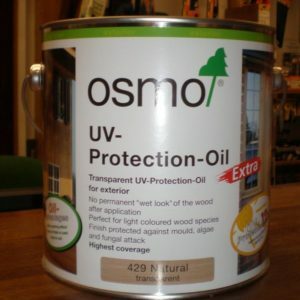 Osmo UV-Protection Oil is one of the best options you can select for slowing this process down. 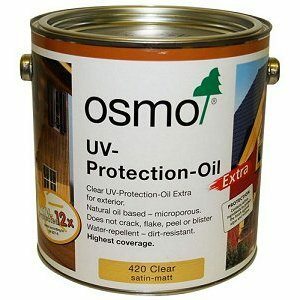 As with all Osmo products the UV-protection oils contain natural ingredients, for a natural satin finish that enhances the gain and character of the timber use Osmo UV-Protection 410. If you are looking for a product that will also help against Algae, mildew and fungal attack use 420, this product has all the properties of 410 but with the addition of biocides for that extra resistance against algae, mildew and fungal attack. Darkening of the timber is a common result of oiling or varnishing. Osmo Natural (429) has an additional ingredient of white based pigment, On lighter coloured timber this white pigment reduces the darkening effects of the oil. This is a stand alone product and is only recommended for use on light coloured timbers like Oak, Beech and Pine. In addition to 410 & 420 clear Osmo also produce UV-Protection Oak 425 , designed for use on exterior Oak this oil carries a oak pigment. The theory behind this is that the UV damage occurs on the pigment rather than the natural colours of the timber therefore prolonging the life of the natural colours of the timber. UV-Protection Cedar (428) does exactly the same as above with a few added preparations steps but carries a cedar colour pigment. With all Osmo oils the is two coat application and these need to be done sparingly.